Premium, no-sheen, natural-look, solvent-based penetrating sealer formulated to provide maximum stain protection, especially in food preparation and serving areas. 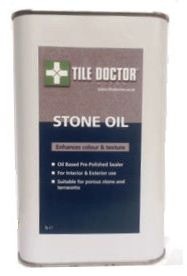 Tile Doctor Stone Oil is an easy to apply pre-polish impregnating sealer, ideal for low porosity stone and terracotta designed to enhance the colour and texture of floors and improve mechanical strength once cured. Use on Polished Marble, Terracotta, natural stone and other porous tiles where a natural look is required, effective for interior or exterior applications. Coverage; per 10m2 per 1ltr on lower porosity floors approx. and 2ltrs per 10m2 for higher porosity floors. TEST A SMALL AREA: According to application instructions to determine desired results. Read entire label and shake well before using. Ensure surface to be treated is completely dry and free from Contaminants which may prevent Stone Oil from properly curing. Apply by Brush, Paint pad or lint free cloth depending on the required application, please note more porous stone may require more than one application, remove any excess Oil that has not been fully absorbed with in an hour with Lint free cloths. Leave to cure for a minimum of 24 hours before finishing the surface with a suitable sealer. Important if using this product outside finish with a coat of Tile Doctor Ultra-seal to offer extra protection. Used cloths should be burnt after use, as they may spontaneously combust. Available in 1 litre tins at £14.99 each, Postage and Packing £5.50 for a one litre tin, £10.00 for two or more litres (All prices are shown inclusive of VAT).